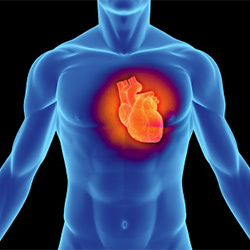 Cardiology is the study of diseases of the heart which is very well catered for here at Harley Street. Our specialist cardiology clinics deal with a wide range of heart conditions such as angina, cardiomyopathy and cardiovascular disease as well as recommendations for a healthy heart. They also provide heart screening services for athletes and sportspeople engaged in high intensity training or endurance events. Male hearts are slightly larger and heavier than female hearts. Your heart is a cone shaped muscle which consists of 3 layers and 4 chambers. These three layers are: the endocardium (inner), myocardium (middle) and pericardium (outer). The four chambers are: left and right ventricles (lower) and left and right atrium (upper). Each chamber contains a valve which enables blood to flow towards the heart. There is a wall of muscle called the septum which divides the heart into left and right sides. The main function of your heart is pumping blood, nutrients and oxygen around your body. It contracts and relaxes which causes blood to flow away from the heart and around the body or towards the lungs where it picks up oxygen. Oxygen depleted blood from the body flows into the upper chamber in the right side of the heart. It flows through the lower chamber and pulmonary artery back towards the lungs. Once there, it takes on oxygen and releases carbon dioxide. It flows away from the heart through coronary veins. Oxygen rich blood flows from the lungs into the upper chamber in the left side of the heart. This then flows out towards the body via the lower chamber and aorta to deliver vital oxygen to the cells. It flows through coronary arteries to the heart. Your heart rate is determined by your age, physical fitness and lifestyle. All of these are treated at our cardiology clinics. Our clinics employ internationally renowned consultants, specialists and surgeons with many years of experience in this field. They all have international reputations within their various sub-specialities and are supported by a dedicated team of nurses, technicians and other related professionals. Our clinics also include support services normally found within a hospital such nutrition, physiotherapy, pharmacy and optometry. These are carried out in pleasant surroundings with state of the art facilities and the latest technological developments in cardiology. Your treatment plan includes an initial consultation and detailed examination followed by a series of diagnostic tests. These include 24 hour monitoring, CT scans, and ultrasound plus normal/stress echocardiography. Treatment options range from medication and lifestyle changes through to surgery such as fitting a cardiac pacemaker or an angioplasty. They can also advise on preventative or post-treatment measures such as reducing cholesterol levels, eating healthily, taking exercise and lowering stress levels. This also includes cardiac screening for high risk groups where there is a family history of heart disease or people engaged in high level sports.